The Sony A6000 is probably one of Sony’s most popular releases to date. This mirrorless digital camera takes the compact body of a point-and-shoot and combines it with the versatility of a DSLR. Ultimately, this gives you a lightweight device that can accommodate a variety of lenses, despite not technically being a DSLR. Of course, with the demand for mirrorless cameras like the A6000 on a steady rise, lots of brands have come out with different lenses to suit every discriminating taste. So if you’re looking for the best lenses for Sony A6000 cameras, you might be surprised to find a wealth of options. Not quite sure which lens will suit your needs and preferences the best? This definitive guide to the best lenses for Sony A6000 should help you land a solid choice. Some lenses don’t cater to a specific style, and instead step-up what your camera can already do on its own. These all-around lenses are the perfect photography staple, ideal for improving your point-and-shoot outcomes to give you professional results with minimal effort. All around-lenses should be versatile, able to cover a variety of situations without compromising quality and ease of use. So if you’re looking for a lens that you can use to simply get the best out of your camera for everyday use, these top 5 best all-around lenses for Sony A6000 should steer you in the right direction. What makes a good all-around lens is a versatility. That is, you’ll want it to be able to capture professional-grade photographs in a variety of settings without compromising quality and ease of use. Generally speaking, all-around lenses for the A6000 come with a highly customizable focal length that makes them more suitable for a number of different subjects – from landscapes to portraits, and even macro images. Taking all of these factors into consideration, it’s easy to see that the Sony SELP18105G E PZ 18-105mm G OSS takes the cake as one of the best all-around lenses for Sony A6000 cameras. What makes it a great pick is its versatile focal length, ranging from 18mm to 105mm to give you the ability to capture images in a variety of styles. The SELP18105G works great as a telephoto lens with its 105mm maximum focal length, giving users a shallow depth of field that picks out just the details of the subject being taken pictures of. This produces beautiful soft-blur bokeh that adds a touch of dramatic aesthetic to your images. If you’re interested in taking pictures of full landscapes however, the SELP18105G works great as well, giving you the ability to use the lens as a full-on wide angle lens that’s ideal for sceneries and sights. For everything else in between, this lens definitely still delivers. Lots of users leverage the SELP18105G for portrait, food, nature, and sports photography as it does have the makings of the perfect all-around lens for the Sony A6000. With a high-performance E-mount, the SELP18105G is very easy to install and remove – another feature that makes it a perfect choice for people who want a great all-around lens. This prevents the clumsy process of installing a lens with a poor mount design. For everyday use, this proves to be a great advantage. Wide focal length range, giving you greater possibilities with the pictures you take. Works great as a telephoto lens, a wide-angle lens, and everything else in between. The high-performance mount makes it easy to install, ideal for everyday use. Durable build prevents damage from wear and tear. Dust-proof construction keeps dirt and small particles from entering the lens and compromising image quality. Lightweight and compact for those who want to be able to bring their lens around with ease and convenience. Can’t function as a macro lens. Not all lenses come at a pocket-friendly price. In fact, lots of the options you’ll find might set you back several hundreds of dollars which is, not something all of us are willing to spend. If you’re looking for something a little more cost-efficient, the Sony E 55-210mm Lens might be a good choice for you. This all-around lens for the A6000 packs a powerful punch with a practical price tag. First off, the lens offers a great focal length range. Albeit unable to achieve the same wide angle lens configuration as the previous entry, it does push the telephoto range, creeping into macro lens territory with a maximum focal length of 210mm. This means you can take pictures of up close subjects like insects, flora, and fauna in great detail. Another reason why the Sony E 55-210mm makes a great everyday photography companion is its construction. Much like the other lenses released by Sony, this particular option was constructed to perfection, featuring superior resistance against damage, wear, and tear. This is especially important if you plan to use the Sony E 55-210mm as an everyday lens as frequent use could lead to a busted lens. Lots of those who purchased the Sony E 55-210mm praise the lens for being a great choice for wildlife photography as it works well as a telephoto lens with its maximum focal length. It also features a round aperture that makes bokeh look particularly dreamy and soft, unlike other lenses that use pentagonal apertures that compromise out-of-focus-area quality. All in all, the Sony E 55-210mm gives great value for the cost. So if you’re looking for the ideal everyday lens companion at a reasonable price, the Sony E 55-210mm might just be one of the best lenses for Sony A6000 users. Super pocket-friendly price considering the device’s capabilities. Definitely a top pick for buyers who want a budget option. Offers a versatile focal length range, working as a standard lens, telephoto lens, and a macro lens. Robust construction resists wear and tear, making it particularly ideal for everyday use. Round aperture improves the quality of out of focus areas for top quality, professional-grade images. Lightweight and compact, ideal for taking with you anytime, anywhere. Makes some noise when focusing, so it can be a poor choice for video capture. Doesn’t work well as a wide-angle lens. When Sony released its mirrorless camera line, lots of buyers took the chance and dove into purchase their own units because of the features and functions they offered. The cameras were a big hit in the market, and continue to rack up sales because of how they combine a compact size, a reasonable price, and professional-camera level versatility. That said, lots of third-party brands also jumped on the bandwagon to get a bit of the profit. The Sigma brand was one of them. 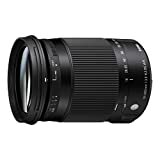 Today, the Sigma 18-300mm F3.5-6.3 Contemporary DC Macro OS HSM Lens is one of the best third-party lenses for the A6000, giving users superior functionality in a relatively cheaper package. The Sigma 18-300mm F3.5-6.3 Contemporary DC Macro OS HSM features a highly versatile focal length range, able to achieve wide-angle aesthetic all the way to superb macro, and everything else in between. Plus the fact that the lens offers all of these styles at a fairly reasonable price point makes it even more appealing to buyers. Buying a lens of the same caliber from the Sony brand – or any other prominent, world-class brand, for that matter – could easily set you back over a thousand dollars, which is why the Sigma 18-300mm F3.5-6.3 Contemporary DC Macro OS HSM is a fair choice for those who want a top quality lens at a reasonable cost. Some other factors that make the Sigma 18-300mm F3.5-6.3 Contemporary DC Macro OS HSM a great pick are its ultra silent AF system which makes it a good lens for video capture, its built-in optical stabilization capabilities for distortion-free images, and it’s super multi-layer coating that keeps colors intact for vibrant outcomes with each snap. Fairly reasonable cost considering the features that the lens offers. Comes at a much lower price than other lenses in the same segment under brands like Sony. Highly versatile focal length ranging from 18mm to 300mm, allowing users to achieve a variety of photography styles with a single lens. Compact and lightweight, perfect for everyday use. Easy to carry around and install – a common feature buyers look for when it comes to buying the best all-around lenses for Sony A6000. Able to capture images in crisp, clear quality despite being a third-party lens, which is something uncommon among these types of lenses. Construction may not be as reliable as that of lenses from better-known brands. May require the use of a mount adapter to suit the A6000. When they said lenses for the Sony A6000 could cost you a fortune, they weren’t kidding. And the perfect example of how expensive these lenses can get is the Sony 18-200mm F3.5-6.3 E-Mount Lens. Costing just a little shy of a thousand bucks, this lens was designed for those who are invested in getting the best results out of using their Sony A6000. The Sony 18-200mm F3.5-6.3 E-Mount Lens was designed to cover all of the different subjects and scenes you might want to photograph. The lens allows a great range in terms of focal length, allowing a minimum of 18mm for wide angle shots, and a maximum of 200mm for telephoto captures. Staying true to Sony form, the 18-200mm F3.5-6.3 E-Mount Lens perfects image stabilization technology, giving you noise and aberration-free images no matter how shaky your hand might get. A perfect round aperture makes out-of-focus areas soft and dreamy, helping users achieve the ideal bokeh for dramatic outcomes. Another reason why this lens wins when it comes to giving you daily satisfaction out of your A6000 is the fact that the lens can autofocus with greater ease and speed compared to other lens options. This helps users capture fast-moving subjects with greater precision, ensuring sharp outcomes despite being in motion. Finally, the Sony 18-200mm F3.5-6.3 E-Mount Lens is fairly lightweight, compact, and convenient to install and remove. These are all great features you should look for in an all-around lens, especially considering the frequent use you might put it through. All in all, the Sony 18-200mm F3.5-6.3 E-Mount Lens proves to be a great pick that shines with top-notch outcomes, thus making the cost seem like a reasonable price to pay – especially if you’re out to get the very best lens for your A6000. Super high-quality construction, guaranteeing many long years of frequent everyday use without giving in to wear and tear. Round aperture helps users achieve high-quality out-of-focus-areas for a variety of photography styles, especially for telephoto captures. Focal length spans a great range, from 18mm to 200mm to cover a number of different scenes and subjects with ease. Extra-low dispersion glass minimizes aberration and noise and ensures that colors stay crisp during any light conditions. Offering great features, the only setback with the Sony 18-200mm F3.5-6.3 E-Mount Lens is the cost. Unless you’re truly invested in your A6000 and want to use it as a professional camera, it may seem unreasonable to spend such a large amount on a single lens. ✔ Large Aperture - designed with high quality multi-coated optical glass. Exquisite body features amazing maximum aperture of F1.1, which creates fascinating background blur effect and sharper image quality. No worries about low-light environment or nightscape, just shoot and enjoy the safe and fast shutter speed. ✔ Premium Optical Design - 12 circular aperture blades, 5 groups of 5 elements lens structure with high quality multi-coated optical glass, ensures low image distortion, excellent image sharpness and great contrast. 50mm focal length is equivalent to 75mm on APS-C camera. Perfect for portraits shooting with fascinating background blur effect. ✔ Compatibility - compatible with SONY E-Mount Digital Cameras, such as SONY NEX3, 3N, 5, 5T, 5R, 6, 7, A5000, A5100, A6000, A6100 and A6300. Also compatible with A7 series full-frame cameras when APS-C Mode is on. ✔ Easy to use - with the focal length scale and smooth focal ring. Even if you are a photograph rookie, it's still very easy to focus what you want and feel the unique charm of this manual lens. It will help you more concentrate on the image itself. ✔What you get - lens, lens hood, lens front & rear caps and microfiber cleaning cloth. NOTE: Camera NOT INCLUDED. Who says that prime lenses can’t be all-around lenses? With the Kamlan 50mm F1.1PS-C Manual Focus Standard Prime Lens, you’ll discover just how handy a prime lens can be. Sure, it can’t achieve the great variety of styles that zoom lenses can, but what it lacks in versatility, it makes up for in image quality. Needless to say, the Kamlan 50mm F1.1PS-C Manual Focus Standard Prime Lens proves just how sharp a prime lens can be. This lens features a 50mm fixed focal length that’s perfect for everyday photography – giving you just the right amount of bokeh to add drama to your shots without overpowering the image altogether. The ultra large aperture is designed with 11 different aperture blades and comes together to create a perfectly round aperture. This helps give your images much better quality altogether, as the aperture takes on a perfect circular shape. The coated optical glass promises to keep colors vibrant and accurate and minimizes noise and distortion that could take away from image quality. Some might complain that the Kamlan 50mm F1.1PS-C Manual Focus Standard Prime Lens is a manual focus length, requiring more effort out of the user to get perfect sharpness. But because of its smart design, the lens can be easily focused on your chosen target without much hassle. Compact, easy, convenient, and capable of coming up with professional-level results, there’s little left to desire once you have the Kamlan 50mm F1.1PS-C Manual Focus Standard Prime Lens in your possession. It also pays to keep in mind that this lens falls within the cheaper end of the price range, so if you’re in the market for a budget-friendly prime lens for your everyday use, then the Kamlan 50mm F1.1PS-C Manual Focus Standard Prime Lens is a perfect choice. Cost-effective, especially if you’re looking for a purchase worthy third-party prime lens. While it doesn’t have a great focal length range, its 50mm focal length is more than enough to capture a variety of subjects in great detail with substantial bokeh. Manual focus gives users the liberty to experiment with different styles and strategies to get the best out of each shot. Makes up for its lack of focal length variety with superb quality images in vibrant colors. Ultra large aperture gives images superior quality and detail and allows users to leverage the lens even in low light settings. Manual focus can be extra sensitive to movement, so users may have to practice utmost care when handling the focus function. More often, photographers want to get up close and personal with their subjects, whether it’s a rare bird in the distance or an athlete in action. Whatever the case, we can’t always just walk up to them and ask to take a good picture. So in these instances, it’s always best to come prepared with a zoom lens. Zoom lenses have the capability to bring us closer to our targets without us having to move from our spot, which is why they’re an essential for any photographer. The Sony A6000 can be fitted with a number of different zoom lenses, and we’ve rounded up the 5 best of them here. When buying zoom lenses, people often have one thing in mind – power. The more zooming power a lens has, the more effective it can function as a zoom lens. This is especially true if you really want to leverage that zoom function so you can get a step closer to your targets without leaving your spot. We’ve weighed the options and the best of the best zoom lenses for Sony A6000 is clear. For this category, we just had to choose the Sony FE 70-200mm F4 G OSS Interchangeable Lens as the top contender. Offering a number of different functions and features at a superior quality compared to other options, it becomes easy to understand why the FE 70-200mm F4 G OSS Interchangeable Lens comes with the price tag that it has. The lens elements inside the FE 70-200mm F4 G OSS Interchangeable Lens feature superior construction and quality to guarantee optimal outcomes with each use. The lens promises to maintain vibrant coloration and reduces discoloration and noise with its high-quality photographs even in low light settings. Some other features that also make it a clear winner in the segment include its focus hold button and its focus range limiter. These two features make it much easier for users to lock in on their targets, so as not to lose their subject to movement. The focus hold button prevents the focus from moving and changing once you’ve adjusted it to your chosen setting. This locks the focal length so you won’t have to worry about accidental adjustments as you take your time to perfect the shot. The focus range limiter puts a range limit on your shot so your lens won’t have to seek through the whole 70-200mm focal length range. This makes autofocus a lot faster and helps prevent the lengthy process of waiting for your lens to warm up to the scene by searching through a wide focal length range. Powerful zoom capacity perfect for people who want a versatile zoom lens that can accommodate a variety of situations with ease. Fast autofocus function keeps users from having to wait for their lens to adjust to situations. High-quality optics for perfect outcomes with each use. The lens promises to generate professional grade pictures with vibrant color and minimal to no noise for optimal outcomes. Focus hold button prevents the accidental adjustment of the focal length during use. Focal range limiter means users can set the lens to focus within a specific focal length range so you won’t have to go through the entire range to wait for the perfect length. Pretty pricey, even for a professional grade zoom lens. Can be bulky for some users who want something a little more travel-friendly. If you’re not completely sold on the previous choice on the list, then the Sony FE 70-300mm SEL70300G F4.5-5.6 G OSS Lens might be a better fit for your needs Slightly less expensive (however not quite cheap as well), this lens packs a number of great features that put it in second place on this subcategory for the best lenses for Sony A6000. Firstly, the lens features a full-frame configuration, which means you won’t end up with cropped images of what you capture. This eliminates the guesswork associated with using the lens, as what you see is ultimately what you get when you peer through your viewfinder or screen. The zoom lens can cover a focal length range that starts at just 70mm to 300mm, making it a great telephoto option that can be used for a variety of subjects and targets with optimal outcomes. Many of those who purchase this lens often use it for wildlife photography, food photography, action photography, and even macro photography, depending on the subject being captured. It features a 9 blade circular aperture that optimizes the entry of light into the sensor. This means your bokeh will be the best quality, giving your images superior depth and drama, and providing softly blurred out-of-focus-areas that don’t overpower or compromise your subject. Equipped with a linear actuator, the lens can autofocus fast with minimal noise. Because of its wide focal length range, this can be an advantage as those without the technology tend to take more time and make a lot of sounds, which can be problematic for those who want to be able to use their lens for videography purposes. Comes with a wide focal length range that makes it a very versatile telephoto for portraits, food, action shots, wildlife, and a variety of other subjects and sceneries that you might want to capture. Features a sleeker, smaller body than the previous option which makes it a better choice for photographers on the go. Linear actuator reacts fast and operates silently to prevent interruption during video capture. Provides users options for both autofocus and manual focus, extending the versatility of the lens and allowing you the capacity to experiment with your outcomes. Round aperture is perfect for creating seamless out-of-focus areas to add drama and depth to your pictures. While it is cheaper than the first lens on the zoom lens subcategory, it’s still pretty expensive, costing upwards of a thousand dollars for a single unit. There’s this notion among buyers that zoom lenses – because of their ability to zoom in and out of a large focal length range – have to be bulky. In many ways, that can be true especially if you try to scour the market for your options. You’re likely to find a larger number of big, bulky zoom lenses than you are to find anything that fits your pocket. However, if you’re a photographer on the go and you want to be able to carry your new zoom lens around with you minus all the hassle, the size of your lens is likely of utmost importance. Luckily, Sony listens to its buyers and proves this by giving us the Sony SELP1650 16-50mm Power Zoom Lens – a tiny yet powerful zoom lens that can easily fit any bag or pocket. The SELP1650 is a small zoom lens that features a focal length ranging from 16-50mm. This makes it something of a cross between wide angle lenses and standard, to even low-end telephoto lenses. When turned on, the lens expands, however, once it’s turned off, the lens compresses to just a little over an inch in height, so you can keep the device in your pocket with ease minus all the fuss of having to juggle it inside a bag. The little lens comes with Power Zoom technology, capable of closing in on distant subjects with ease and seamless operation. Its internal stepping motor helps guarantee fast, smooth, and silent autofocus functionality that also makes it an ideal pick if you want to use your lens for the purpose of video capture. All in all, the SELP1650 is an amazing lens that gives a lot of great outcomes despite its tiny construction. Plus, the compact body is built to the highest of standards, guaranteeing the lens’s capability to withstand the onslaught of daily wear and tear, perfect for buyers who want something they can use regularly. Considering the fact that it also comes at a very reasonable cost, it’s easy to see how this lens made it to the third spot on this sublist. Ultra compact, perfect for photographers who travel or who want something they can easily carry around without much hassle. Powerful zoom capacity gives the device superior zooming properties despite being so small. Silent autofocus is fast and seamless, making the lens great not only for photography but for video capture purposes as well. Can work as a wide angle lens, a portrait lens, and even a low-end telephoto lens. Boasts a much more reasonable cost compared to the other zoom lenses on the list. Was not intended for sale in the US, so warranties, manuals, and adapters may not coincide with US standards. Lots of the time, buyers want something that feels familiar, that doesn’t require too much of a learning curve, that makes them comfortable knowing they’ve got something that will effortlessly step up their photography game. That’s why a lot of the more complex choices on the list often get ignored despite being good products – simply because they seem too ‘complicated’ to learn. If you’re in the market for something closer to an industry standard zoom lens, then the Sony 28-70mm F3.5-6.5 FE OSS Interchangeable Standard Zoom Lens could be your best pick. This lens combines all the things we know and love about the standard zoom lens construction, and simply dedicates itself to helping you achieve better quality images minus all the time, effort, and learning. The lens comes equipped with a focal length that ranges between 28-70mm, making it a great wide-angle to portrait length zoom lens. It features all the industry standard features expected of a Sony zoom lens, including the three aspherical elements and the extra-low dispersion element to prevent aberration and noise. It also features an optical steady-shot functionality that gives users utmost confidence with each snap, knowing they won’t have to deal with distortion even with shaky hands. Finally, the entire device was built moisture and dust resistant, keeping it clean and functional even when subjected to daily use, wear, and tear. All of these factors come together to give you the ultimate standard lens that will help step up your photography prowess without the clumsy learning curve. Features a focal length that ranges from 28-70mm, giving it substantial versatility for a number of different functions and subjects. Construction boasts three aspherical elements and one extra-low dispersion element to lock in colors, prevent aberration, and minimize noise. Optical steady shot functionality gives images superior clarity and sharpness even in low light settings. Moisture and dust proof construction gives the device greater resilience against the onslaught of daily wear and tear so you can use it with confidence knowing it won’t give out too soon. The lens feels familiar, so users won’t have to worry about the clumsy learning curve associated with other, more complicated lens models released by the brand. Comes at a much more reasonable price compared to the other more expensive options on the list. The lens is only available in its international version, so buyers may not be able to get the most of its warranties and other features under US standards. There are a lot of factors that come together to create a great lens. But ultimately, what truly matters are the internal mechanisms that work to give your lens the functionality it has and the ability to generate professional-level pictures. That said, some lenses come out as more viable options than others, especially if they feature the right mechanisms to create pictures that are truly great. All of these things taken into consideration, there was no doubt that we had to include the Sony SEL1670Z Vario-Tessar T E 16-70mm F4 ZA OSS lens as one of the options for this category in the list. The lens takes pride in its high-end lens technology that surpasses the outcomes generated by any other lens on the market. What sets the SEL1670Z apart from other choices is its Carl Zeiss T* lens coating. Carl Zeiss pioneered coated lenses, and this lens pays homage to his breakthroughs by giving users high-quality optics that feature the ultimate benefits. The coated lens on the SEL1670Z basically eliminates flare, internal reflection, and light scattering, giving you perfectly lit images without all the effort. This is particularly beneficial for users who enjoy taking captures outdoors where perfecting light can be tedious, time-consuming, and sometimes, close to impossible. Other features of the SEL1670Z are the industry standard for the Sony brand. As for its focal length, the lens boasts a wide range that can cover landscapes to portraits with ease. The mild telephoto can easily convert into a wide-angle lens, based on the user’s needs, which is why it also works great as a daily lens for people who want an everyday photography companion. Carl Zeiss T* lens coating makes the lens virtually impenetrable to lighting problems and aberrations, giving you perfect lighting with each shot minus all the effort. The lens features a wide focal length that can cover wide-angle functionality, portrait photography, and everything else in between for superb versatility. The body is built to the highest of standards, giving users a heavy, reliable, and robust lens that they can take to virtually any photography session in confidence. Compact enough and easy to install, ideal for photographers who enjoy travel, or who want a lens that’s not a hassle to take along with them. Not exactly the most expensive, but isn’t really all that cheap either. May cost a little more than others would be willing to pay. Contrary to the zoom lens is the prime lens. These lenses aren’t capable of zooming and offer the same, consistent focal length for every shot it takes. You might be wondering – why would anyone choose a prime lens over the versatile zoom? The answer is simple – image quality. Because they have less complicated optics and more dedicated functionality, prime lenses are able to produce higher quality images with minimal to no distortion or noise at all. Plus, they’re perfect for photographers who have found their niche in the industry, knowing exactly what they want out of each shot. Prime lenses can be a lot harder to choose from compared to zoom lenses because there are a lot fewer factors to consider. Sure, many of us would assume that having less to think about should make drawing a decision easier, but the lack of relevant factors can make it even more challenging to find an option that truly suits your needs and preferences. Despite the challenge, one prime lens came out on top during our search for this list of the best lenses for Sony A6000 cameras. And our number one selection for this subcategory would have to be the Sony 50mm f/1.8 SAM DT Lens. This small, lightweight, and compact lens is non-zoomable but offers a lot of functions that are almost guaranteed to satisfy even the most discriminating of photographers. It features a fixed focal length of 35mm, making it ideal for portrait photography. Inside the device is a smooth and silent autofocus operation with its own built-in motor – otherwise called SAM. This makes it particularly ideal for users who want to leverage the lens for taking videos as well. In fact, working well as a silent portrait lens, the 50mm f/1.8 SAM DT Lens often caters to users who want a decent lens for vlogging purposes. When it comes to image quality, the 50mm f/1.8 SAM DT Lens definitely delivers. This top-notch lens is one of Sony’s best prime lenses to date, able to generate professional-level pictures with minimal effort on the user’s end. This makes it an ideal starter lens for those who are just starting out, or a great point-and-shoot lens for buyers who want great results without having to tweak their lens and camera settings too much. Super compact and lightweight, small enough to fit in your pocket. This makes it a great prime lens to carry around with you during your travels. 50mm focal length is the optimal length for a variety of subjects, so even if the lens is a prime lens, it can cover a number of different targets with utmost quality. Effortlessly professional grade pictures, ideal for those who want to step-up their point-and-shoot images, or for beginners who are just starting to learn the ins and outs of photography. Boasts a state of the art autofocus mechanism that guarantees silent and fast focusing, perfect for those who want to use the lens for videography purposes. Very affordable despite offering such high-end results with each use, making it a real steal for buyers who want a budget-friendly lens that truly delivers great results. Some units may come out with manufacture defects, so be sure to hold on to your warranty. You’d be surprised how expensive prime lenses can be. Because they can deliver much higher quality images than zoom lenses, they often come with more sophisticated optics that make them more capable of producing professional-grade pictures. So in your search for the best prime lenses for Sony A6000, you might struggle to find something that fits your budget. Fortunately, there are lots of third-party brands that offer great picks without putting too much stress on your wallet. The Neewer brand is one of them. Offering a wide array of lenses for the A6000, this brand is now one of the most popular on the market, becoming a top choice for buyers looking for budget-friendly lenses without sacrificing quality. The Neewer 35mm f/1.7 Manual Focus Prime Fixed Lens makes its way to the third spot on our list of the best prime lenses for the Sony A6000 for several good reasons. Firstly, the lens is probably as cheap as they get, costing less than a hundred bucks. This makes it a great choice if you’re trying to watch what you spend, but still, want to indulge your penchant for photography. It features a metal mount that promises a stable connection to your A6000, so you can confidently use it in a variety of settings. It also boasts a durable, moisture and waterproof body that withstands the test of time, wear, and tear to give you a lens that you can use and enjoy for many years to come. 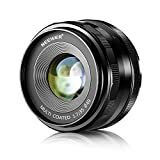 The glass lenses themselves that make up the Neewer 35mm f/1.7’s optics are multi-coated, ensuring top quality color and sharpness to give you high-quality results in a variety of photography settings. The 35mm focal length is perfect for landscapes but also serves a worthy purpose as a portrait lens, giving you great versatility despite the lens being a prime lens. At just under a hundred bucks, this ultra-budget option gives great quality, making it a great pick if you want something that won’t scuff up your wallet. The 35mm focal length is great for landscapes but also functions well for portrait photography giving you greater use out of your lens. Multi-coated optics allow the device to generate high-quality pictures with superb, vibrant color and exceptional sharpness. Not a full-frame lens, causing some vignette with the Alpha series. One of the benefits of having a prime lens is portability. Because they don’t expand and change length due to their inability to zoom in or out, these lenses have a much smaller construction. So when you go in search of the best prime lenses for Sony A6000, you’re likely to find some pretty compact choices. If you’re in the market for something that’s exceptionally pocket-friendly however, the Sony SEL-20F28 might just be the perfect pick for you. This lens features an ultra-thin construction, boasting a body that measures just an inch in thickness. This means you can carry the SEL-20F28 lens in your pocket with ease, switching it with other lenses you might have in your arsenal without having to carry an entire bag. Much like other Sony lenses, the SEL-20F28 features a circular aperture that perfects out-of-focus-areas for superior bokeh quality. This gives images a more dramatic appearance. The focal length is fixed at 20mm, putting the lens on a wide angle and a portrait lens configuration. So it’s a great pick if you like taking pictures of landscapes and human subjects. Finally, what puts the SEL-20F28 as a front-runner among all the other options on the market is the fact that it features a sophisticated autofocus system. What this does is it limits the time it takes to autofocus, allowing you to achieve your desired outcomes in a shorter amount of time with much less noise. When it all comes right down to it, the SEL-20F28 is yet another great Sony lens that deserves a spot in your arsenal. Especially because it comes at a reasonable mid-range price, it makes a very practical purchase for photographers and photography amateurs just the same. Offers superior results, providing professional-grade pictures with ease so you can step-up your game effortlessly. Ultra-compact design makes it easy to carry around, reducing the hassle of bringing a bulky spare lens in a dedicated camera bag. Round aperture makes bokeh exceptional, making out-of-focus-areas beautifully blurred. Reasonably priced compared to other lenses, making it a practical choice for both professionals and beginners. Excessive lights can cause flaring in images, burning edges with too much brightness. Looking for something that won’t cost you more than a few dollars in change? You’d think you wouldn’t be able to find a lens in that price range, but the Opteka Achromatic 10x Diopter Close-Up Macro Lens proves otherwise. This ultra-powerful macro lens can magnify close-up subjects by up to 10x, giving you a crisp, clear, and highly detailed image, perfect for macro photography enthusiasts. And the best part? It won’t cost you much more than a little over twenty dollars. The Opteka Achromatic 10x Diopter Close-Up Macro Lens produces high-quality images as close as 4 inches from the subject, allowing you to capture all that wonderful detail that makes macro photographs interesting and entertaining. The lens offers 2 element HD, multi-coated optics that allow it to generate much sharper images than any other lens on the list. These also help the device capture perfectly realistic colors so you can truly appreciate the beauty of your subjects. Small, easy to use, and convenient, the Opteka Achromatic 10x Diopter Close-Up Macro Lens makes enjoying macro photography even more exciting. The device is ideal for those who are just starting out on the style, and even those who have had extensive experience with up-close shots. To wrap everything up, this lens comes with a high-quality metal body that’s both moisture and dust proof. This keeps it well protected against the contaminants it might come into contact with during your use, so you can be confident that your lens will last a long time without giving in to wear, tear, and exposure to contaminants. All in all, the Opteka Achromatic 10x Diopter Close-Up Macro Lens is a premium lens that comes at a very reasonable cost. And even if you don’t end up sticking with macro photography – or don’t like the results of your Opteka for some reason – you won’t have a lot to feel sorry for as the lens costs a very small price. Powerful magnification capabilities, able to close-up on subjects 4 inches from the lens up to 10 times. Offers superior detail, color, and image quality, which are all essential factors that buyers look for when buying a macro lens. Lightweight and compact, it’s easy to carry the Opteka lens in tote to use for a variety of settings and even unexpected encounters with subjects that make perfect macro targets. Super affordable, at just a few dollars over twenty. This means you can dive into the purchase without worrying about buyer’s remorse. Some units may be sent out without a user manual, making buyers have to do the guesswork on installing the lens. Someone who has been using zoom lenses their whole life might find there to be a learning curve with the use of prime lenses. Of course, if you’re accustomed to a lens that expands and contracts depending on how you want to focus it, you might find it strange to use one that doesn’t budge at all. So to help you transition from zoom to prime lenses, it’s best to look for an option that doesn’t confuse you right off the bat. The best choice, in this case, would have to be the Sony FE 50mm F1.8 Lens. Offering a number of features that make it both user-friendly and easy to understand, this lens is the lens of choice for buyers who want to try their first ever prime lens. The FE 50mm F1.8 Lens was designed with prime lens beginners in mind. It features a large F1.8 aperture that accommodates a lot of light to eliminate the trouble and tedious legwork that comes with finding the right lighting. It’s 50mm focal length is ideal for taking pictures of a variety of subjects, including buildings, portraits, and even wildlife. This makes it easy for zoom lens users to adjust to their new prime lens by exploring what they can do with a single focal length. With a well-developed autofocus mechanism, the device can focus on your subjects with greater ease and speed. This proves to be beneficial for users transitioning to prime lenses as zoom lenses tend to take more time because of the focal length range they first need to search before ending up with the right length. Finally, the FE 50mm F1.8 Lens features refined optical performance. With a double-glass configuration, the lens offers superior results that differ greatly from zoom lens outcomes. This helps encourage users to continue using their prime lens as it generates higher quality images with less noise, zero color distortion, and no aberrations to come up with clear, crisp, and vibrant pictures with each use. Reasonably priced despite all of its offered features and functions. This gives buyers greater value for money. Works well as a transition lens for people who want to move from zoom lenses to prime lenses. Refined optical performance highlights the benefits of using a prime lens, giving users the ability to generate high-quality images with little effort. Fast AF system is silent and reliable, making it possible for you to capture images of your subjects with speed. Compact and lightweight, easy to carry around during travel. Hardy and durable, perfect for everyday use. 7 blade aperture doesn’t produce a perfectly circular bokeh, unlike Sony lenses that have 11 aperture blades. A slight struggle to autofocus in less than perfect conditions. Called ‘wide angle lenses’ because of their ability to capture expansive landscapes and scenery, these are the lens of choice for photographers who prefer taking pictures of different sights and places. Wide angle lenses are able to create beautiful detail across a wide area, making them perfect if you love taking pictures of the outdoors. There are quite a number of wide angle lenses compatible with the Sony A6000, and here are five of the best if you’re looking for something that will suit your fancy. You’d think that the best lenses for Sony A6000 cameras should come from the same brand, but lots of third-party brands have stepped up their game so significantly that they can compete closely with branded releases. That said, it’s always good to check out all your options when in search of the best lenses for Sony A6000 so you can get a better idea of just what’s available to you. In this category of the best wide angle lenses for Sony A6000, the top contender doesn’t come from the Sony brand at all. In fact, the lens was developed by Rokinon – a new third-party brand that caters specifically to buyers who want budget-friendly camera accessories without sacrificing quality. That’s why the Rokinon 12mm F2.0 NCS CS Ultra Wide Angle Lens gets our bet as the ultimate wide angle lens for the Sony A6000. This premium built wide-angle lens features an amazing 12mm focal length – making it highly capable of capturing expansive landscapes and sceneries with utmost ease. Despite the wide-angle configuration, however, the lens is also able to produce a beautiful shallow depth of field, giving your shots more dramatic effect. With a unique Nano Coating System (NCS), the lens can reduce flare and internal reflections to give you perfectly lit images with no aberration, noise, and distortion. This also helps guarantee that color is locked in, giving your shots vibrant life. Finally, when it comes to the cost, the Rokinon 12mm F2.0 NCS CS Ultra Wide Angle Lens won’t set you back an unreasonable amount. Offering such great features and high-quality outcomes within a practical, mid-range cost, this lens is definitely an investment you’d want to make. Ideal focal length of 12mm makes shots particularly dramatic, allowing users to capture expansive areas within single shots for the ultra wide angle effect. Optimized for optical quality, making outcomes vibrant, sharp, crisp, and highly detailed for utmost satisfaction. Works great as a professional grade wide angle lens, allowing you to explore and expand your skills. Nano Coating System guarantees the reduction of lighting issues, so you can shoot in a variety of light settings without worrying about aberrations, glare, and reflections. Aperture range spans from 2.0 to 22, allowing the lens to work in a variety of light settings, including low light and indoor locations. Very reasonable price considering all the features that it offers, so you can get all the best results with a reasonable cost. May not be as durable as Sony brand lenses. Usually, you’ll find that most of the best wide angle lenses for Sony A6000 are fixed or prime lenses. That is – they won’t zoom. This is because when people buy wide angle lenses, they don’t look for a range and instead settle with a single focal length with which to work with. So it’s not common that you’ll find a zoom lens in the exclusively wide-angle lens category. Despite that, Sony has come out with its own exclusive wide angle lens that features a zoom lens construction. That is, the device falls within the wide angle category and doesn’t cross into portrait or standard lens configuration, but still offers a focal length range that produces solely wide-angle lens results. Say hello to the Sony SEL1018 10-18mm Wide Angle Zoom Lens. This is one of Sony’s front-runners in the wide-angle lens categories, featuring a small yet versatile focal length range that allows users to experiment with different wide angle lens capture styles. This makes it a great pick for those who are just starting out with wide-angle photography, giving them options to find a wide-angle configuration that works out for their specific style and taste. The device also comes with an expansive aperture range, with a minimum aperture of f/22, and a maximum of f/4. This makes it operate optimally in both well lit and low light conditions, giving you greater opportunities to experiment in a variety of situations. With built-in optical SteadyShot technology, the SEL1018 makes it easy for users to capture highly detailed and extra sharp images even in shakey environments. So you can be confident that with each snap, you’re getting a high-quality picture that doesn’t waste your time and effort. Much of the rest of the lens features the standard Sony construction, such as the circular aperture, extra low dispersion glass, and the aspherical elements that all come together to guarantee the quality of your photographs. Needless to say, the SEL1018 is also highly capable of reducing flare, aberrations, and noise, so you can enjoy optimally sharp outcomes with each use. Despite being exclusively wide-angle in functionality, the lens does come with a rather flexible focal length range so you can find the right wide-angle configuration to fit your fancy. Durable and robust, the SEL1018 is the perfect example of how Sony maximizes craftsmanship to come up with reliable lenses. Refined optics ensures beautiful outcomes with each use, so you can confidently snap away in a variety of settings without having to put in too much effort. Aperture can accommodate different light situations so users can enjoy the lens in both well lit and poorly lit conditions without sacrificing image quality. Maybe a little overpriced for some buyers, costing close to a thousand dollars. For those in search of a Sony brand wide angle lens in the prime lens category, the Sony SEL16F28 might be right up your alley. This premium lens from the brand boasts a fixed focal length of 16mm, which makes it a great pick for those who don’t want to take time fiddling with the focus on the previous zoom lens option. The SEL16F28 is much more compact than the SEL1018 and features a durable metal body that guarantees a longer life than many other lenses on the market. The ultra-refined optics helps make sure that each of your pictures are captured with superior quality and color, minimizing any potential noise and distortion especially around the edges of your pictures – a common problem among other wide angle lenses. The device features a compact body and build, making it small enough to fit in your pocket. This makes it a great lens for photographers who dislike having to bring a bag-full of camera accessories that can weigh them down on the field. Plus, the SEL16F28 was built for everyday use, wear, and tear, so you can beat the lens up with frequent usage without having to worry about breaking it. Inside the lens is an internal focusing mechanism that keeps the lens the same compact size no matter the focal settings. This also makes sure that the lens performs autofocus functions with speed and accuracy so users don’t have to wait too long to get a picture of their subject. Compact, lightweight, efficient, and wallet-friendly, the SEL16F28 is yet another great Sony lens that promises to give you the best bang for your buck. Considering the fact that it also comes at a much cheaper price than other Sony lenses on the market, this lens can be a great choice if you don’t want to overspend but still want the quality of a tried, tested, and trusted Sony brand lens. Ideal focal length at 16mm doesn’t exaggerate the wide-angle configuration so users can generate artfully captured images with proper proportions. The compact body makes it easy to carry around wherever you go. Constructed with daily use, wear, and tear in mind, so you can confidently use your lens on the daily without worrying about damage. Sony refined optics allows the lens to take superior quality images effortlessly. Much cheaper than other Sony brand wide angle lenses. May not satisfy professional photographers who expect to gain more out of using a wide angle lens. The Rokinon brand has definitely impressed a lot of consumers with its quality affordable lenses, and the Rokinon FE14M-E is proof of that. This lens is yet another entry in our list of the best lenses for Sony A6000 cameras, and for very good reasons. The wide-angle lens features a focal length of just 14mm, making it fall in the range of ultra wide-angle. The device boasts a solid construction and superior build that make it the perfect companion for everyday use. Unlike other Rokinon lenses in the past that struggled with construction, this one seems to make up for those past releases, promising users they can confidently use the lens without worrying about damage. Optimized and refined lens optics features a multi-coated glass that prevents reflections and ghost images from appearing in your shots. This is particularly important for those who want to use the lens outdoors, as perfecting lighting situations under natural conditions can be a challenge. The circular diaphragm is another reason why the lens competes with the Sony line of lenses. This helps the device soften out-of-focus-areas, giving you better bokeh that brings your subjects and landscapes to life. It also comes with a petal-type hood that makes it possible to get the perfect lighting conditions no matter where you might be. At a very reasonable cost, the Rokinon FE14M-E definitely doesn’t play around. So if you’re in the market for another Rokinon lens to add to your growing arsenal of A6000 accessories, this one might be the one for you. Cost-effective without sacrificing great image quality and user experience. Built-in petal hood helps optimize lighting conditions, especially outdoors. High-tech lens coating prevents lighting aberrations and keeps colors intact and vibrant. Circular diaphragm makes out-of-focus-areas beautiful and softly blurred to bring more attention to your subjects. Robust construction compared to other Rokinon lenses. Takes some time to autofocus in less than perfect conditions. For those who really don’t want to spend much on a wide angle lens, or for buyers who are interested in exploring budget-friendly choices just to expand their existing A6000 accessory arsenal, the Opteka Super AF Wide Angle Fisheye Lens is a great pick to play with. Unlike other wide angle lenses on the list, this particular choice pushes the boundary of wide-angle photography, giving you a 180-degree coverage that creates fun and exciting wide-angle styles. Its optics were designed to take sweeping captures of extra expansive areas, so you can practice with a fun aesthetic that many other lenses can’t generate. The Opteka Super AF Wide Angle Fisheye Lens features a focal length range of 3.6-11mm, making it a unique lens that adds a touch of character to your pictures. It’s also great for buyers who want to experiment with the extremes of wide-angle photography, giving you greater access to different creative styles that other lenses won’t allow. Another thing that makes the Opteka Super AF Wide Angle Fisheye Lens a major hit among buyers is its cost. Characteristic of the Opteka brand, this lens comes at a super wallet-friendly price that won’t scar your budget too severely. Offers a unique aesthetic that other lenses can’t achieve, giving users the capacity to explore their skills and style. Ultra-affordable, typical of Opteka brand lenses. You can purchase the lens without worrying about ‘wasting’ your cash as it really is very affordable. Comes with a unique focal length range at 3.6-11mm, which is uncommon among other lenses. Fairly compact and lightweight, so you can bring it along with convenience to your trips in case of situations that call for an ultra wide-angle shot. Build quality isn’t the best there is. Takes quite some time to achieve the right focus. Adding a touch of character and old-school appeal to your images are vintage lenses. These lenses can be adapted to suit your A60000’s mount, and are designed to give your pictures a distinct appearance of old, making them ideal for those who want to conform to a certain style of photography. While there aren’t a lot of vintage lenses on the market, there are some that can be very satisfying to use with the Sony A6000. This list of our top 5 best vintage lenses for Sony A6000 puts together the cream of the crop so you won’t have to go through all the guesswork. For buyers in search of lenses that add a touch of character and charm to photographs, vintage lenses are the only way to go. 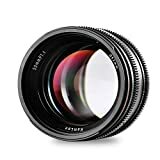 These lenses are capable of giving you unique, beautiful, and artful images that shine with an aura of a time gone, making them ideal if you want to really step-up the quality and aesthetic of your pictures. The A6000 can accommodate a variety of vintage lenses – given that you have the right adapter for certain models. But the very best of the best lenses for Sony A6000 cameras in the vintage category has to be the Minolta 50mm F1.7 AF Lens. This particular option can bring a sophisticated vintage feel to your pictures and is especially easy to use and install, unlike other vintage lenses that take a lot of effort before you can even use them. The lens features a focal length of 50mm, making it a great standard lens or portrait lens if you want to use it on a daily basis. The optics feature a coated design that helps them generate beautifully aged photographs that perfectly capture that vintage feel that many photographers strive to achieve. The aperture features 7 aperture blades that come together to create a circular diaphragm. This means you can create beautiful out-of-focus-areas that add to the overall aesthetic of your pictures, making your outcomes even more breathtaking. Finally, despite being a beautiful vintage lens, the Minolta is very affordable. At just a few dollars shy of fifty, this high-quality lens can seriously step-up your photography skill without setting you back too much in terms of the cost. Ultra-affordable, making it a great purchase for buyers who don’t want to overstep their budget with an expensive vintage lens. Generates superior outcomes despite its cost, giving you beautifully aged results with minimal effort. Lightweight and compact, not weighing down to excessively on your camera kit. Features the ideal focal length of 50mm for a variety of different subjects. Takes some time to focus. Scuffing on the barrel may cause aesthetic issues with some users. Mounting on the A6000 makes the lens fully manual. If you really want something super budget friendly, then the Industar-69 28/28 USSR Soviet Russian Wide Angle Lens should be your first pick. Coming at a very affordable cost, this lens is the top choice for buyers who are just starting out with vintage lenses because it assures them that even if they end up disliking the results, they wouldn’t have spent too much on the lens altogether. The only flaw with that line of thinking is that the Industar-69 USS Soviet Russian Wide Angle Lens does anything but disappoint. This lens can help produce beautiful results with its wide-angle lens configuration. It boasts a focal length that’s adjusted to accommodate a range of wide-angle focal lengths, making it a great pick for those who want to generate beautiful vintage pictures of landscapes and cityscapes. The lens has a wide aperture that ranges from a maximum of 2.8 to a minimum 22, allowing you to use it in a variety of light conditions without sacrificing image quality. It also features a solid metal construction that doesn’t only give it that vintage lens feels, but also makes it particularly robust against wear and tear. Compact and lightweight, the Industar-69 lens is the perfect companion for your travels and photography dates. The device was designed as a reliable everyday lens, so you can be confident that with the small amount you spend for it, you’re going to get a lens that you can gladly use every day for optimal results and outcomes. Compact and lightweight, making it easy to carry around and use for an effortless photography experience. Wide aperture range allows users to leverage the lens in a variety of lighting settings. Focal length is ideal for wide-angle captures, allowing you to generate images of beautiful landscapes and sceneries with a vintage feel. Metal construction is both aesthetically pleasing and durable. Includes its own lens caps for both the front and rear for easy storage and maintenance. Mounting can be tricky on the A6000. Some users may experience vignette around the edges of the frame. There’s a learning curve that comes with switching from a contemporary to a vintage lens. This is because vintage lenses have operational differences that make them slightly trickier to get used to. That said, if you’re just starting out with your vintage lens, you might want to purchase something that will make that transitional learning curve less demanding. The Jupiter-8 50mm F2 Vintage Screw Mount Lens is the perfect vintage lens for beginners for several good reasons. Firstly, it features a familiar 50mm focal length that makes it a great portrait and standard lens, so you can capture images of easy subjects to eliminate the chances of having to feel around for the right focal length. The lens also features an easy screw mount attachment that makes the installation process easier and more convenient. This is especially important if you haven’t handled vintage lenses in the past because some of them can be very difficult to install. The lens’s optics are clean, clear, and refined, allowing you to capture beautiful vintage images with minimal effort. So if you’re just starting out, the lens basically encourages you to keep learning more about vintage photography by eliminating the confusion and learning curve that comes with the territory. Screw mount lens is a lot easier to install compared to other lenses, so you won’t have to worry about attaching it to your camera. 50mm focal length is perfect for a variety of subjects and situations, allowing you to explore your horizons with ease and confidence. Effortlessly beautiful images with each snap makes it much easier for you to appreciate the art of vintage photography. Lightweight and compact, reducing the bulk that you’d have to carry around to a shoot or during travel. Complete manual functionality means users still have to exercise some effort to optimize image outcomes. Some scuffing around the barrel can cause aesthetic issues for some buyers who want a lens that feels brand new. The Olympus brand is one of the fore-runners in the photography industry, running as one of Sony’s close competitors. This brand has released countless gadgets and devices through the years, making it one of the most popular brands for those who truly love photography. Their Olympus OM-System E. Zuiko Auto-T 100mm F.28 Telephoto lens makes its way to this section of our best lenses for Sony A6000 super list for a number of different reasons. The first is that its particularly made to the highest of standards, so each image boasts superior sharpness, clarity, and color quality, while still offering that beautiful vintage feel that we all love. Secondly, the lens is fairly easy to mount. Although users may need a mount adapter to get the lens to fit, it’s not quite as fickle as other lenses on the market. So you can easily figure out how to get it to latch on to your A6000 without too much of a fuss. Thirdly, the Olympus OM-System E. Zuiko Auto-T 100mm F.28 Telephoto lens is one of the few vintage lenses that offers a telephoto standard focal length. This allows users to take close up pictures of subjects while creating beautiful, soft-blurred backgrounds that pick out the best details of your target. Ultimately, this creates a completely different vintage aesthetic that very few other lenses are able to achieve. Finally, the Olympus OM-System E. Zuiko Auto-T 100mm F.28 Telephoto lens is built to the highest of standards. The body of the lens feels reliable and durable in hand, so you can use it on the daily with confidence, knowing it won’t fall apart on you anytime soon. Durable and robust construction keeps the lens safe from damage, wear, and tear, even with frequent daily use. 100mm focal length makes it work as a versatile telephoto lens, and even as a portrait lens so users can leverage the device for a number of different subjects and styles. The mounting system is fairly easy to figure out, despite having the typical vintage lens construction. Takes some time to achieve the proper focus configuration. Some discoloration may occur around the edges of pictures. Users may need to study the lens in depth during use to get the best results. Last on our list of the best vintage lenses for Sony A6000 cameras is the Helios 77M-4 50mm F1.7 Russian Vintage Lens. This lens – while labeled vintage – doesn’t necessarily produce such a strong vintage feel in your pictures, which may be beneficial for some users. This is especially true if you don’t necessarily want your pictures to look ‘old’ per se, and simply want a lens that adds a touch of character and warm color to your shots. The Helios 77M-4 50mm F1.8 Russian Vintage Lens features a 50mm focal length, which is the industry standard for most vintage lenses. The device boasts a 1.7 aperture that’s quite large, able to capture a large amount of light making it great even in low light situations. The lens glass is coated, giving a tinge of warmth to your captures and preventing overexposure to reduce the appearance of flares and ghosts. It also helps keep your images sharp, so you can enjoy pictures with utmost clarity and crisp detail. The only reason why the Helios 77M-4 50mm F2.8 Russian Vintage Lens didn’t make it higher on the ranking is that it doesn’t produce the same vintage effect that other lenses do. In fact, some might even say that the lens isn’t vintage at all, in terms of outcomes. Nonetheless, it does offer some pretty solid results, and may just be what you’re looking for. Compact and lightweight, ideal for everyday use. Easy to install, featuring a mounting system that’s intended for A6000 cameras. 50mm focal length makes it compatible with a variety of subjects including landscapes, portraits, and wildlife. Lens coating prevents aberrations, discoloration, flares, and ghosts. Images produced are high quality, to say the least, with their own unique aesthetic that crosses the border between contemporary lenses and vintage lenses. May generate a vintage look that doesn’t necessarily coincide with some users’ expectations. 7 Of The Best Travel Lenses For Sony A6000 Cameras On The Market! 3 Of The Best Real Estate Lenses For Sony A6000 Cameras! 3 Of The Best Vlogging Lenses For Sony A6000 Cameras! 2 Of The Best Fisheye Lenses For Sony A6000 Cameras! The Best Vintage Lenses For Sony A6000 Cameras!